A flatfoot deformity is diagnosed when the entire surface of the bottom of the foot comes in contact with the floor. Some people are born with flat feet, while others can lose their arch over time. Proper treatment can prevent discomfort and allow you to walk comfortably and help your body maintain its natural balance and gait. Flatfoot deformities can be uncomfortable, but treatment is available that will allow you to live a full and active lifestyle. Both children and adults can be affected by flat feet. Dr. Fihman is capable of addressing the condition in people of all ages, finding positive treatment solutions that restore proper form to the foot as well as dramatically improve foot function. When a child is born with no arch to their foot but the foot still functions normally, it is referred to as a pediatric, flexible flatfoot. With a child's flexible flatfoot, the joints and muscles move as they should without producing pain or discomfort. The foot of an infant or toddler doesn't have much of an arch to begin with. Over time, the more they use their feet to crawl and eventually walk, the muscles, tendons, and ligaments become stronger, eventually pulling the bottom of the foot upward, creating an arch. The tightness of the tendons and ligaments will determine the arch of the foot as well as its strength. When flexible flatfoot is present in a child, the arch will be visible when they are seated or laying down but will disappear as soon as they stand up. When a child is born with flat feet, they may not start to develop an arch until around five years of age. For some, an arch never develops. In order for Dr. Fihman to accurately diagnose pediatric flexible flatfoot, she will have to evaluate the form and function of your child's feet. She will be looking for three primary conditions: pediatric flexible flatfeet with an overly tight Achilles tendon or a more serious condition known as rigid flatfeet. The first question to be answered is whether or not your child has a neurological disease or any conditions that affect their muscles. Dr. Fihman will also want to know if anyone in your family has flat feet. The wear patterns on their shoes will also be evaluated to determine what areas of the foot bear the most pressure. Radiographs and other types of digital imaging will be used to evaluate and identify any abnormalities within the structure of your child's feet. For most children, pediatric flexible flatfoot does not cause or any generalized discomfort. Dr. Fihman will only treat the condition if it's causing harm to your child or they are experiencing any type of pain or discomfort. There are many non-surgical treatment methods that can be used to help support the feet and improve flexibility. Stretching exercises that involve the heel cord are extremely beneficial. If the child is experiencing mild pain related to certain types of activities, then exercises can be added that help to strengthen the foot, ankle, and leg. Custom made orthotics are also an option to help stabilize the foot and ankle and relieve pressure on certain areas of the feet. An orthotic supports the arch of the foot and prevents the foot and ankle from pronating or rotating into an awkward position. Pronation causes the foot to turn inward and the arch to collapse. If this continues to occur and increases in severity, Dr. Fihman may have to perform surgery to correct the problem. There are many different treatment options that can be used to help correct this type of abnormality. While orthotics are extremely beneficial, a more direct approach may be needed. In this case, placing an implant inside the foot will offer the same benefit as an orthotic, the only difference is that it provides support from the inside of the foot. Adult acquired flatfoot can be the result of either injury or disease. Taking proper care to treat injuries to your feet when they first occur is the key to maintaining your arch and proper foot function. Illnesses like diabetes, obesity, and high blood pressure that affect your circulation can have a devastating effect on your feet as the amount of nutrients and oxygen they receive through the blood continues to diminish. If you have been diagnosed with any of these conditions, it is of the utmost importance that you work diligently to maintain the health and well-being of your feet and ankles. Acquired flatfoot in adults is often characterized by pain and discomfort along the posterior tibial tendon. The tendon runs along the inside of the ankle and down into the foot. This can cause swelling and inflammation along the inside portion of the ankle. The more active you are, the more pain and discomfort you will feel. For some, the inability to stand for long periods of time and increased difficulty while walking may also be present. If these conditions are left untreated, they can cause the hell bone to shift and excess pressure to be placed on the outside of the ankle causing it to collapse. This can be extremely painful, and may eventually lead to arthritic changes in the midsection of the foot itself. Bony bumps may begin to appear on the inside and along the top of the foot. If the bony spurs grow large enough, they can impact the nerves leading to numbness, tingling, and extreme pain. Individuals who have already been diagnosed with rheumatoid or any other type of arthritis may experience even more discomfort due to the condition affecting the cartilage within the joints. This can also have an impact on the ligaments. 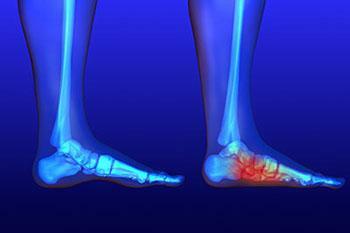 As these conditions worsen, the shape of the foot can begin to change, causing the arch to gradually weaken and fall. Injuries that affect the ligaments and other connective tissues in the foot can pull the foot out of alignment, placing pressure on the ankle. This will eventually work its way up through the ankle and into the leg, affecting your gait and pulling your hips out of alignment as well. Torn ligaments can be extremely painful and will cause the foot to flatten almost immediately. Foot deformities are also caused by other types of damage to the foot including fractures, sprains, strains, and dislocations. If you have diabetic neuropathy or other conditions that cause nerve damage in the feet, your arches may begin to collapse as your conditions progress. In most cases, conservative treatment methods can provide relief from the pain and discomfort of acquired flatfeet in adults. Conservative treatment can include orthotics, braces, and wrapping. With proper support for the arch, the progression of certain conditions that affect the foot can be dramatically slowed, and in some cases, halted, providing sufficient relief. Surgical procedures such as tendon transfers, tendon repair, implants, fusions, and heel bone re-positioning are used to reconstruct the arch of the foot and restore proper position of the heel bone. These procedures are considered when more conservative methods have failed. While there are many ways to surgically correct flat feet, Dr. Fihman will base her choice of procedures on your specific condition and how much damage is present. Multiple procedures may be used as needed. Because the treatment plan is patient dependent, there is no specific treatment that is considered to be a “go-to” operation. Each person is different and each treatment plan is unique. Dr. Fihman specializes in the correction of flatfoot deformities. She is capable of treating both children and adults, providing them with the highest quality of care dependent on their specific needs and conditions. She is able to perform a variety of procedures that will help to restore proper form and function to the foot, correcting abnormalities and deformities that cause flat feet and other serious conditions that affect how you walk or run. Her first order of business is to evaluate your condition. She will then work to identify potential abnormalities or injuries that may be present and formulate an effective treatment plan that addresses each issue. With the treatment plan in place, she can work with you as your condition improves, ensuring that your level of pain and discomfort is managed effectively and you are able to perform your day to day activities in a normal fashion.